Use bridge:structure=* to describe the load-bearing architecture of individual bridge spans. (A span is the part of a bridge between two of its supports.) Simple bridges may have one span between the abutments on which it rests at each end; others may have multiple spans and many supports. Sometimes a bridge will have more than one type of span in its length. In these cases, the way can be split at the support where the type of span changes and each piece tagged with a different value of bridge:structure=*. It is proposed to use this tag as well on man_made=bridge. The area should be split as well if a bridge has more than one type of span. bridge:structure arch In an arch bridge, the span is supported by a curved arch, which transfers some of its weight into horizontal thrust against the abutments. bridge:structure beam In a beam bridge, the load is transferred entirely to a span resting on a support at either end, without additional reinforcement. bridge:structure truss In a truss bridge, the span consists of a series of interlocking triangular units which bear the load. bridge:structure floating A bridge whose load is supported by floating on water, rather than resting on fixed supports. Typically a pontoon bridge. bridge:structure suspension A bridge where the load is supported from a cable under tension, attached to anchorages at each end of the bridge. In most, but not all, suspension bridges, the cables are suspended between towers near each end of the bridge. 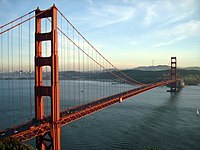 bridge:structure cable-stayed A bridge where the load is supported by cables radiating from the tops of towers resting on supports along the line of the bridge. bridge:structure humpback An arch bridge with significant vertical elevation changes of the bridge deck along the arch, also called moon bridges in Asia.